These are unique prints. You will NOT find them anywhere else. 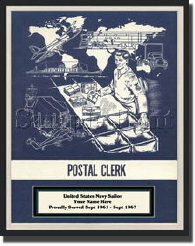 Any sailor who served in the US Navy would remember these training manual covers. The covers represent the job (rating) that sailors were assigned throughout the service. Everyone had one! These prints will definitely bring back a special memory to any US sailor no matter when they served. Most navy men took special pride in their ship, shipmates and their rating. We thought the covers were very attractive and would make a nice keep sake. Your print will be unique and distinctive and will be displayed with pride. If you have something else you would like printed simply email us to let us know what you want. You can also let us know when checking out in the optional instructions. Canvas size is 8"x10" ready for framing. You can add your own personal matte or leave it as it is with the printed matte. These prints are made to order. This would make a nice gift and a great addition to any Navy collection. Would be fantastic for decorating the home or office wall. This photo is printed on Archival-Safe Acid-Free canvas using a high resolution printer and should last many years. It is also sprayed with a clear finish for extra protection. Because of its unique natural woven texture canvas offers a special and distinctive look that can only be captured on canvas. The canvas print does not need glass thereby enhancing the appearance of your print, eliminating the glare.